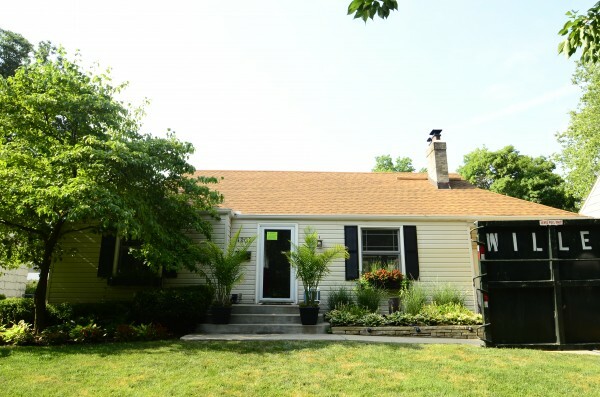 Being a young professional couple and relatively new homeowners the Jennifer and Adam had a desire to add living space to their quaint prairie village home. The existing home was roughly 1100 sq. ft. and only had two bedrooms and one bath. With a wedding planned for the fall and possibility of future children the homeowners wanted to all but double the square footage of their home while being budget minded. Since the old Prairie village home lots are quite confined, the only real option was to “go up”. 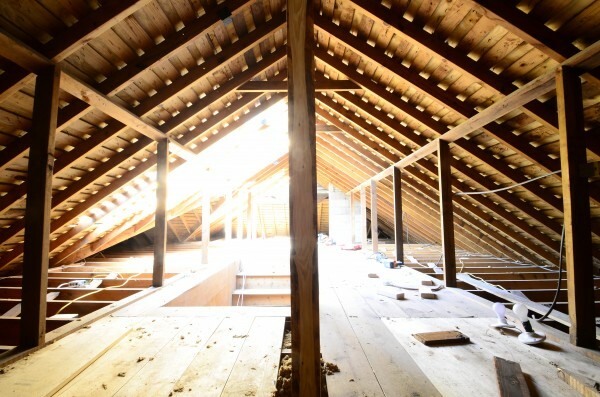 The attic conversion idea was born, but far from coming to fruition. After attending multiple Remodeling shows and meeting with several contractors, there was some frustration because numerous contractors did not take them seriously, according to Adam. Following multiple meetings with us and our design professional, the couple decided to move forward with their dream project. 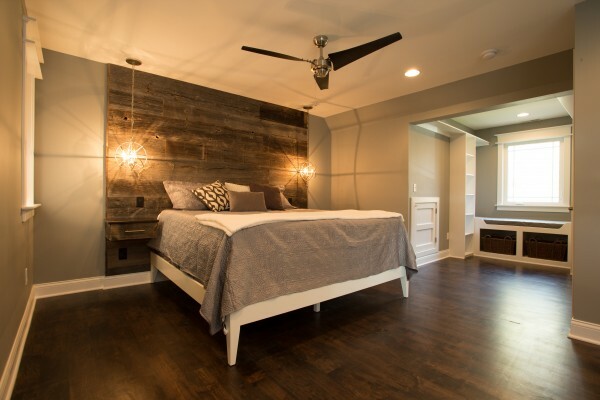 A clever combination of homeowner vision and helpful design ideas have transformed a once unusable attic space to a marquise master suite filled with a splendid mixture of modern and rustic appeal. After selecting the final design and floor plan for the project Jen and Adam desired to make every foot of the their addition usable including; a large master bedroom highlighted with a floor to ceiling reclaimed barn wood head board with cantilevered night stands and ceiling mounted pendant globes, mahogany finished maple hardwood floors, a custom “book nook” in one of the dormers for relaxation and space for possible changing table and crib, a spacious walk-in closet and a master bath of the highest quality. The “Marmara” vein cut marble used for the flooring and the shower truly is stunning. A custom double vanity topped with “Mont Clair” Danby American mined Marble and under mount sinks, the 120 cubic foot shower with a European frameless clear glass enclosure, chrome finished rain head and spray system and the invisible drain truly are unique. A Cambria tub deck with soaker tub projects into the shower giving a freestanding bench seat for the shower. The color combinations of grey’s, bright white and marble blend eloquently with the rustic barn wood, mahogany floors and splash’s of chrome bringing this master suite to life. 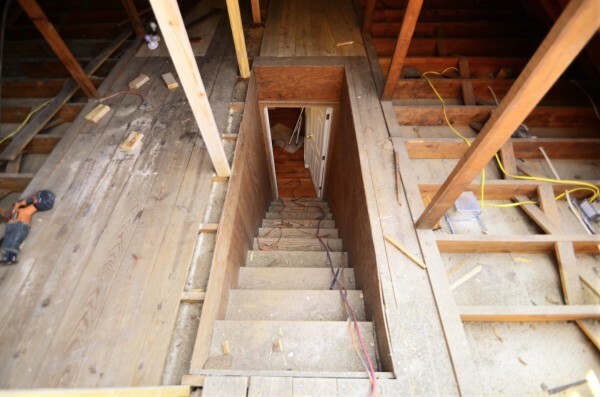 In order to obtain some additional square footage desired by the homeowners we needed to break the existing foot print of the home and cantilever out the back section of the attic dormer addition by two feet. This allowed for roughly an additional 80 square feet of living space in the rear dormer. 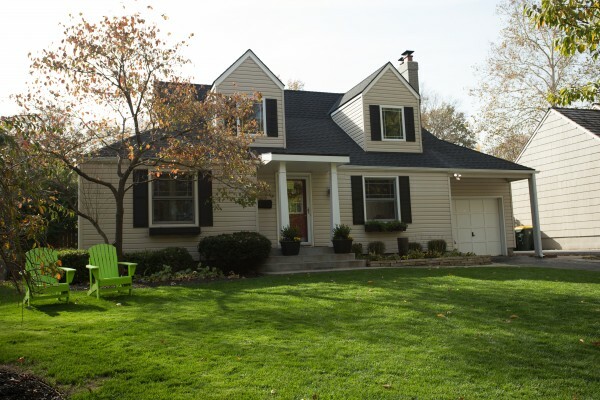 By adding two large dormers on the front in combination with the nearly full-length rear dormer, we added nearly 900 square feet of total living space. 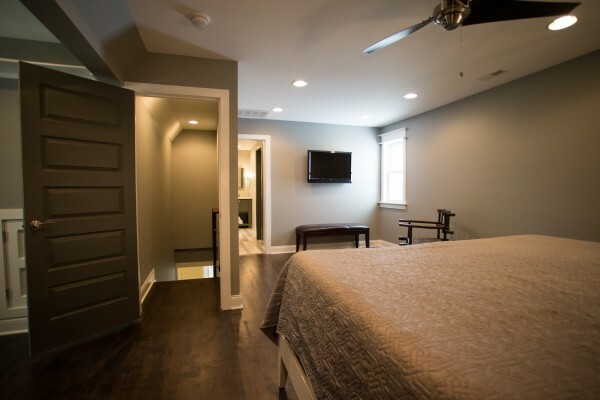 With the use of a mini split HVAC system the homeowners were provided with separate heating and cooling solely for their new addition allowing them to maintain the use of the existing system for the rest of the home. The challenge of adding this much square footage and making the exterior look as if the addition had always there is always an obstacle in a renovation of this magnitude, but by continuing the existing siding and duplicating the shutter application that was currently on the house, we were able to tie the attic addition in nicely, and topped it off with a new swooped porch roof over the entry. Other challenges that were encountered were providing enough additional framing to the structure for adequate support to stabilize the new weight of the addition as well as provide channels from to addition to the basement for plumbing, electrical and HVAC with as little disruption to the existing interior as possible. But all these challenges were met to the homeowner’s advantage and satisfaction resulting in a brilliantly modern yet warm space which is functional, aesthetically appealing and conducive to the homeowners desires for their immediate and future needs. After the final design was chosen and a thorough process of selecting the finishing items the project total came in within 10% of their original budget, not counting the marble which Adam, a tile representative, provided. For a project of this size the scheduling and timing of multiple trades and finish work went as close to planned as possible. The final result? Jennifer and Adams expectations were exceeded and they are elated to have their dream space a reality.